NO MAN'S LAND gives a detailed, on-the-ground account of the 2016 standoff between federal authorities and protestors, led by Cliven Bundy's sons Ammon and Ryan, occupying Oregon's Malheur National Wildlife Refuge. What began as a protest to condemn the sentencing of two ranchers quickly morphed into a catchall for those eager to register their militant antipathy toward the federal government. During the 41-day siege, director David Byars was granted remarkable access to the inner workings of the insurrection as the protestors went about the daily business of engaging in an armed occupation. NO MAN'S LAND documents the occupation from inception to its dramatic demise and tells the story of those on the inside of this movement - the ideologues, the disenfranchised, and the dangerously quixotic, attempting to uncover what draws Americans to the edge of revolution. "Offers a fascinating insight into elements of rural rage in America, and their culmination in the act of desperation at Malheur Natural Preserve. The film also asks significant questions about our democracy at this time, and in general: Why do people who live otherwise comfortable lives feel oppressed? What are the proper and effective ways to make a political statement in a democracy? What place, if any, do military style weapons have in civilian life and democratic protest? As the nation struggles with the political divisiveness of the Trump era, and enduring rage and resentment among the white working class, we must come to grips with the important questions No Man's Land poses." "What a great film! No Man's Land reveals the iconic sagebrush west, and the people who fight over it and call it home, in ways most coverage of the Malheur occupation did not. As someone who teaches and writes about the public lands of the United States, I know viewing the film could lead to a whole semester, using what happens and what is said, for teaching about political theory, public lands, myth-making, and western history. The possibilities are wide and deep." "The film finds a story about tension in rural America, why people might violently defend their shrinking opportunities in the name of what they consider 'cultural heritage,' and what happens when we lose our common bonds and 'start worrying who our neighbors are'...This is the definitive documentary about the mindsets of the key players of the Malheur Standoff as it happened. It is highly recommended for studies about domestic right-wing extremism, rural politics, and land management issues." "[An] intensely visceral documentary which shows just how far some fringe segments of the population are willing to go to stand up for their beliefs." "Excellent. An engaging and balanced account of the Malheur Wildlife Refuge occupation of 2017. While leaving no doubt that the occupiers acted illegally, the film gives fair voice to the frustrations of the Bundy brothers and their many silent supporters. In documenting the tragic consequences of uncompromising division over a seemingly isolated public policy issue, the film provides a cautionary lesson for everyone in our divided nation." "Raw and emotional...Goes beyond the debate over federal lands and its clichéd storylines. Offered instead are more complicated and deeply personal views - on government, the law, democracy, protest, violence, socioeconomics, and culture - that will be sure to engender student interest and debate." "No Man's Land is consistently compelling, and is bound to again stir strong reactions to this clash between self-appointed militias and the laws of the land." "Provides a chilling insight into the real domestic threat in this country, i.e. white Christian Americans challenging the US government with conspiracy theories and semi-automatic guns, whose message gets amplified uncritically by sensationalist media and whose actions are excused by juries and politicians. It should be watched by everyone concerned with liberal democracy in the US today." "Fascinating...No Man's Land provides extensive insight into the perceived grievance of the militants who occupied Malheur National Wildlife Refuge." "Makes the fly-on-the-wall viewer fully feel the peril and the underlying, aggressive masculinity that surrounds it all." 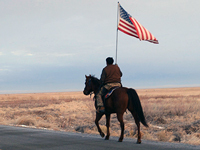 "No Man's Land provides an in-depth and even-handed portrait of the occupation of Malheur National Wildlife Refuge...It does an excellent job capturing the current mood and underlying sense of dispossession and victimization that pervades far-right extremism in the United States. This provides an important resource for use in a number of college-level courses that address issues such as social movements, extremism, and contemporary politics." "The foreboding conclusion: more of such generalized nihilist rage can be expected from self-proclaimed 'patriots' in the Trump era. Recommended." DVD includes closed captions, optional subtitles in English and chapters. "A very interesting and informative documentary...Stunning and intimate...David Byars's nuanced treatment of the occupiers, local residents, authorities and ideologies involved provides valuable insight into an event which continues to baffle land managers and politicians. This documentary sets the baseline for our understanding of what happened in Harney County, Oregon, in January of 2016." "Fascinating...An essential guide to the occupation and the fall-out, the film summarizes the issues without sensationalizing the event as the protests fails...No Man's Land is a riveting, comprehensive documentary."